Multifaceted Benefits of Wearing Amber Necklace. What is the first comment you hear from most people today when they're looking for a way to soothe pain or feel better? If you said, "Is it all natural? ", you're 100% correct. While there will always be prescription drugs for various things, Natural Healing has been around since the beginning of mankind and it is definitely here to stay. And it really makes sense. After all, the body is going to respond to what is natural. Our Immune Systems tend to fight chemicals because they're not "normal" to our bodies. That's why using natural Amber Necklace for healing is a smart choice regardless of your age or your illness. A completely holistic substance, Baltic Amber works with your body's immune system to ease and relieve pain from teething in children to men and women with arthritis to simply supplementing what the immune system needs to ward off infection. Sounds like a pretty tall order, doesn't it? But it works and there are thousands of testimonials to that effect from all over the world and for many centuries past who speak of this healing as "almost a miracle." 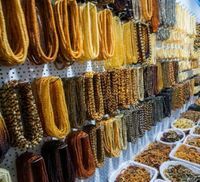 So just how does Necklace made of Baltic Amber work its magic? Here's what history has documented. An organic substance known as Fossil Resin was produced by Pine Trees in Northern Europe over 45 million years ago. What makes Baltic Amber so powerful is that It is also the only fossil resin that contains 3-8% Succinic Acid (mostly located in the Amber's surface layer) - a powerful therapeutic with multiple applications for healing. Scientists have continually attributed the unique attributes of natural Baltic Amber to it's stabilization over time through oxidation. Whatever ails you, Amber Necklace have the ability to provide pain relief for almost everything, head, neck and throat areas involving congestion and respiratory issues. Amber Bracelets are incredibly effective for rheumatism, arthritis, as well as aching muscles and joints. And if stress is one of your main sources of discomfort, you'll find that natural Baltic Amber is an amazing anti-anxiety remedy that removes the effects of fatigue and weariness. Just think - healing is just a few clicks away! Why not start your shopping for amazing Baltic Amber Necklace and get relief now. Whether you fall in love with its beauty or enjoy the bliss of feeling better, Natural Amber can change your life! As a small business, both in our town and in the world, we are extremely focused on every customer. Quality is our #1 priority so that everyone who buys from us has a very successful and personal experience. We are working with natural genuine Baltic Amber and our craft is something we infuse in every sale we make. We want our customers to know how very important they are to us and that we care about every aspect of what we do. Amber is very personal to us. It's the treasure of our country. And it's the most powerful homeopathic remedy that we can give to each and every person who reaches out to us.